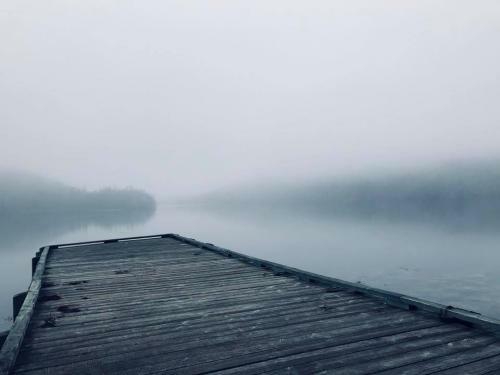 A soft morning fog at the Fisherman’s Museum Life Museum slip dock is a reminder of the beauty and danger afforded by our relationship with the ocean. 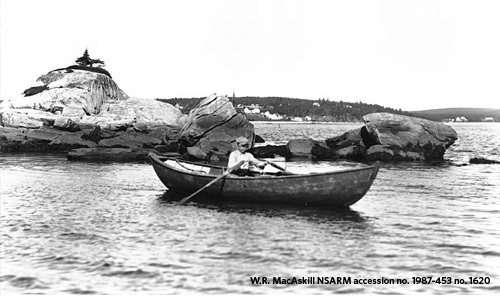 Generations of fishermen, from early Mi’kmaq, to early European settlers, to today, have surveyed this very scene to beginning their work day. 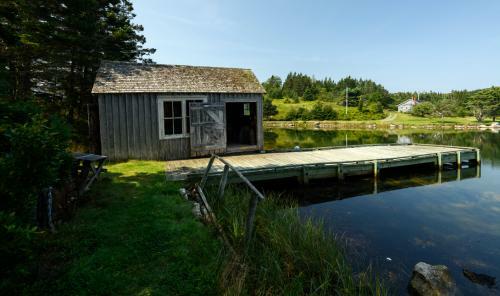 For Ervin Myers in the early 1900s, and before that his father James H. Myers, some days it was only through skill, years of practice, and of course luck, that they made it back at night to the safety of their fish shack, with their nets or traps full. Unlike the offshore fishery, which brings fishermen far and wide in large fishing vessels for weeks at a time, the inshore fishery remains closer to shore in smaller vessels. This allows fisherman to work by daylight and return to shore at night to land their catch. Unlike offshore, inshore fishing is normally an independent (often family-based) industry. For both James and Ervine Myers, this meant fishing in single or double dories with oars, mainly from their fish shack on Roger Barren Island (northeast of the house, in Clam Bay). Most inshore fishermen had fish shacks, which in addition to providing storage for fishing gear and a place to land their catch, was a home away from home, with a plain bed and small stove for overnight stays. Catches varied with the season which ran from April to October - herring, cod, halibut, haddock, mackerel, smelts, lobster, or even eels. They would normally process their own fish, keeping what they needed for their own family and selling the rest, providing an important income. Over the winter many fishermen found additional employment. Ervin Myers cut pulp and worked as a cook in a lumber camp. However, the work of fishing never really ends. Winter was an important times to prepare for the next long fishing season. This included ensuring vessels were seaworthy and gear was ready. Until recently, many fishermen made their own nets and traps by hand. Almost a hundred years later, we might consider the life of an inshore fisherman depicted at Fisherman’s Life Museum as difficult and dangerous. It is important to remember that despite advances in technology, fishing vessels and gear, today’s inshore fishery is still difficult and dangerous. However, like it the Myers’ time, it is also rewarding and important work. 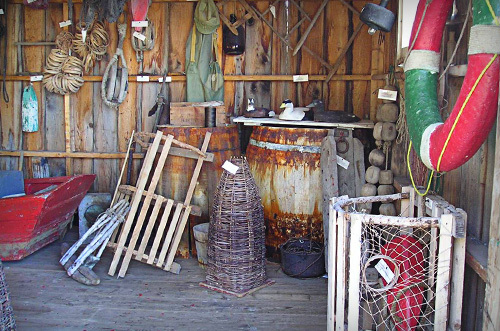 The fish shack at Fisherman’s Life Museum was used to moor boats in the winter and provide a place for Ervin to work on his gear. Today you can still find examples of much of that gear including lobster traps, eel pots, buoys, floats, blocks, hand lines, reels, and nets.